As we have already mentioned, during 2011 we celebrate the year of Fridtjof Nansen and Roald Amundsen, two Norwegian adventurers who were pioneers in the Arctic exploration. Curiously, Amundsen moved to the South Pole with Fram, the same ship that had brought Nansen to his glorious expedition to the North Pole. 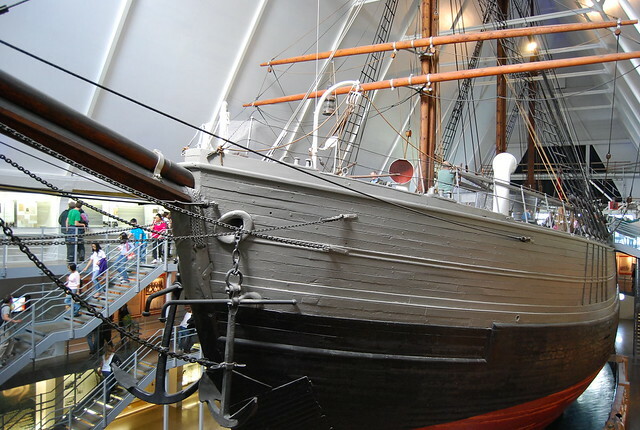 This mythical ship has a museum in Oslo, a kind of tribute to the deeds of these two really extraordinary men. I had the chance to visit it a few weeks ago I would describe it as living adventure history. That’s why I wanted to share it with all of you. Oslo’s Fram Museum is located on the Bygdøy peninsula, so in order to get there you will have to catch the ferry that sails there from the back of Oslo´s City Hall. The entrance costs 40 Norwegian kroner, that is, about 5 euros. There you can go up to the real Fram and descend to their cellars to see how the crews of Nansen and Amundsen lived during their deeds. On the different floors of the boat you can see numerous photos of the adventures of these pioneers, many of them taken by Nansen and Amundsen. They are really extraordinary. Another aspect that may be interesting for Arctic adventure lovers is the great collection of polar exploration books that you can find there. There are some in Spanish, but most are in English. If you have the opportunity to travel to Norway, I highly recommend Oslo´s Fram Museum, as I said, living adventure history.